Or why you should be using Speedroid-F.A., seemingly. The V Jump January Jumbo Issue is currently on sale. We’ll introduce an example of how to use “Platinum Gadget”, which is included as a promo card! By using both “Speedroid” and “F.A.”, you can bring out both “Platinum Gadget” and a Level 7 Synchro Monster, all without Normal Summoning! Imagine a situation where there are no monsters on your field. By Special Summoning “Speedroid Terrortop” from your hand, you can use that effect to add “Spedroid Taketomborg” to your hand. Next, you Special Summon the “Speedroid Taketomborg” you added to your hand, and then use both to Link Summon “Platinum Gadget”! By using the 1st effect of the “Platinum Gadget” you Link Summoned, you can Special Summon a Level 4 Machine monster from your hand to a zone it points to. ※ In this case, “F.A. Sonic Meister”. Following up, you can raise the level of “F.A. Sonic Meister” by 3 by activating an “F.A.” Spell Card. By using the effect of “F.A. Auto Navigator”, you can Special Summon it by lowering the level of “F.A. Sonic Meister”, and then use its 2nd effect to add an “F.A.” Field Spell from your Deck to your hand. And with those two you can Synchro Summon! Special Summon a Level 7 Synchro Monster to a Zone “Platinum Gadget” points to! This time we’re picking “Cyberse Quantum Dragon” included in “Savage Strike”! 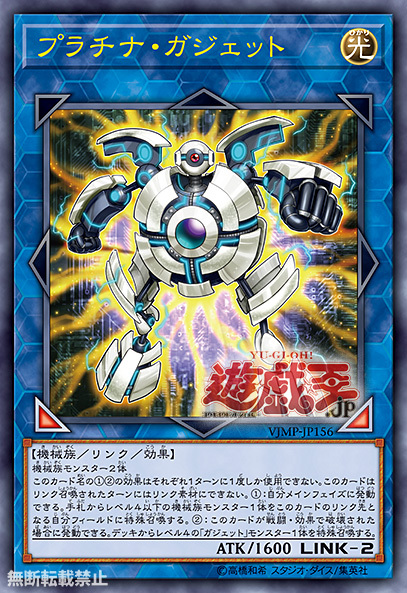 If it’s Linked to a monster, monsters other than this card cannot for attacks or effects, meaning you can keep “Platinum Gadget” from being attacked! We’ll be publishing reports of events in which this Deck was used at a later date! Please look forward to it!